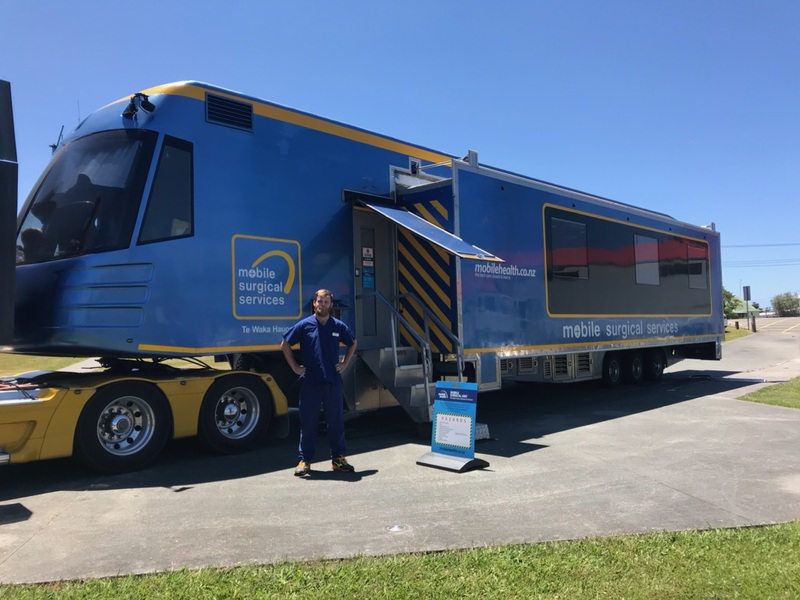 Mobile Surgical services, what a whirlwind way to tour New Zealand and get to assist in improving rural health care throughout rural NZ. This was the way I spent the first month of my elective. After a minor hitch with booking my time on the surgical bus everything was sorted for me to meet up with the mobile surgical bus in Queenstown on the 20th of November 2017, 2 weeks after sitting my final 5th-year exams, and 1 week after finding out I actually passed them. (WoooHooo!!!) I managed to get this amazing elective set up thorough MSS’s General Manager Mark Eager and their mastermind and Clinical Director Dr. Stu Gowland. The Mobile Surgical Bus was the brainchild of Dr. Gowland and is a mobile operating theatre that travels a circuit of New Zealand every 5 weeks and stops in a different rural locality each day. This service provides operating facilities direct to the populations that need them, instead of patients having to go to secondary or tertiary centres for treatment. A wide variety of treatments can be done in the bus and the list for the day is decided by the DHB we happen to be in at the time and where the best outcomes can be achieved through reducing the number of people on waiting lists. There is a large variety of lists and operations performed on the surgical bus. The specialty changed most days and lists included General Surgery: hernia repairs, laparoscopic gallbladder removals gastroscopy, and colonoscopy. Orthopaedics: carpal tunnel releases, Dupuytren’s contracture corrections, and digit amputations. Gynaecology: including laparoscopic investigations and hysteroscopy. The biggest and most frequent lists, especially in the North Island were pediatric dental lists. The best part about being on the bus for me was the large variety of work, and the close contact you got with some of New Zealand’s best surgeons and anaesthetists. As I was the only student for most of my time on the bus I got to assist in pretty much everything. Surgeries were done by local surgeons who spend part of their clinical time working on the bus. There were no registrars, house officers, TI’s or other medical students to have to compete with for assisting, so there was exposure and hands-on experience. During my four weeks on the surgical bus, I spent a lot of time with the anaesthetists. This was a fantastic opportunity as we do not get to experience much of this in our first 5 years at Medical School. As many of the cases we did were quite short it meant I got a lot of experience with the “take off” (putting the patient under general anaesthesia) and “landing” (waking them back up again.) I got to practice many different skills that will be useful to me in my future career in Emergency medicine such as putting in dozens of IV cannulas, setting up fluids, administering drugs, maintaining an airway, bag masking, putting in endotracheal, nasotracheal tubes and LMA’s and learning the basics on how to use an anaesthetic machine with all its bells and whistles.